I’ve had thoughts swirling around for the past few weeks and meant to get them typed up, but with my #MadCowMomBrain, I lost them just as quickly as I composed them in my head. So how about a month (or so) recap? 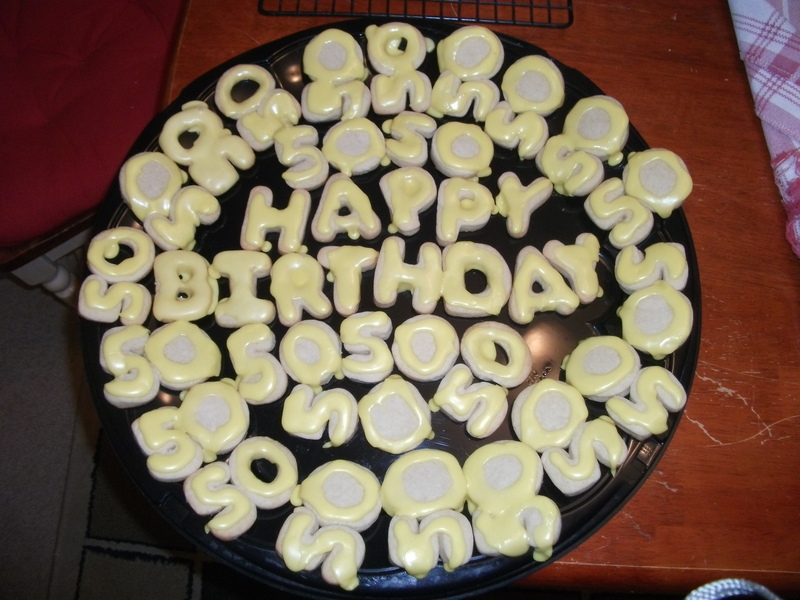 Tip: Don’t try to learn how to decorate cookies on the day OF your party. Some of these say 50, some look like they say SO. I threw a surprise birthday party for FM. Using a private Facebook event inviting our close friends, I conspired with his eldest daughter and best friend on how to get him here AFTER everyone else arrived. I took off two days prior to the party to finish up with my cleaning and get started on all of the cooking. Even with a limited fun budget, I was able to pull off a decent party! #YayMe On the day of the party, the best friend kept FM busy during the day and the eldest daughter made plans to take her Dad out to dinner. I almost hit a snag when he invited me to join them, but using the excuse of just having had pizza for dinner and feeling like a night in with a movie saved me! Vampire Boy’s senior pictures came back. He took a great picture! I survived a week of having an extra roommate. FM’s house was having some work done so he couldn’t stay there for five days. Sometimes when the household chores and bills seem overwhelming, I think it would be nice to have someone to share the house with. I think a week of having a man live here may have fixed that curiosity. It went better than I thought it would considering my place isn’t that large and it only has one bathroom. Have been on my own for over ten years now, I’m back to wondering if I’ll ever be able to live with someone again. I had a truly upsetting event involving Social Diva. She ended up being extremely rude to FM on his last night here. Throw in a bad literature grade and I’m ready to curb her social activities until the grade comes up. She asks to go to the football game with her good friend who lives close by. Since I adore this friend, I cave and allow her go. She ends up texting me from the game that she’s with another friend and asks if they can have a sleepover. The smoke began to stream from my ears. Since she ditched (she claims she ‘lost’) her friend and was hanging out with another friend, I call her to let her know that I am on my way over to pick her up. Did I over-react? Maybe. However, the ditching friends thing is a problem. I was not rewarding her bad behavior and bad grade by letting her stay out. On top of all of that, she flat out lied to me to get to the game and the lies continued as the night went on. In five minutes, I turned into a yelling lunatic (which I never do) and scared the hell out of both kids. There was yelling, door slamming, many tears (both her and I), the kids exchanging text messages with their father (whose house she wanted to go to), and a chat with big brother. All in all, it was a horrible evening for me. Thankfully, today (Sunday) turned out to be a productive day. I got some errands run, weatherproofed my basement windows (it’s not pretty, but let’s hope it keeps the drafts out), and made room for my car in the garage. I’ve got high hopes that the rest of this week is better than this weekend. (This week was the anniversary of my dad’s passing and what would have been my wedding anniversary.) I have high hopes that I can snap out of this funk that I’m in. Next weekend is a road trip to see Red Wanting Blue, so things have to improve, right? Posted on October 7, 2012, in Kids, Ramblings. Bookmark the permalink. Leave a comment.